Pack and ship household items easily, quickly and CLAIM FREE! Pack fragile household items such as Flat Screen Tv's, Computer monitors, Glass table tops and more in seconds! No Cardboard, tape, or other packing materials needed! The Green packer becomes your Tv box, mirror carton and like items. Designed for Professional home movers and packers! Don't waste money buying mirror cartons! Super Extra Heavy Duty Construction! Stack anything on top of this! The Green Packer is now your TV moving box! Move Into The Future With The Green Packer! Click here to see BD Movers Green Packer! "The Tony Box"
Green Packer Moving Box Now Available at Hillside Paper! Fully customizable to suit your company! 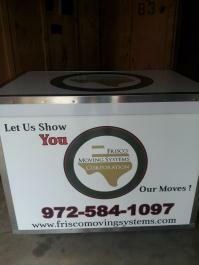 Have a look at Frisco Moving Systems new Green Packer TV moving box! The Green Packer Is Built With Quality Materials And Designed To Last For Years and 100s Of Moves. Items are easily loaded into the Packer's protective durable felt panels, side walls and padded floor. Durable Cam-lock pins and wooden dowel pins. Custom sizes available! Contact Us for Details! Eliminate mirror cartons and 3rd party crating fees! The Green Packer becomes your mirror carton! It is your Tv moving box!